For those wanting amazing countryside, mountain and sea views, a private setting yet just a few minutes drive from all the amenities of Kalkan then Villa Manzara Mavi is the Villa for you. Villa Manzara Mavi has stunning sea views over Kalkan bay and easy access to the village and all of its attractions, a great five bedroom villa at a great price! The Villa is laid out over 2 floors and features 5 bedrooms, 5 bathrooms, 2 lounges and 2 kitchens so brilliant for groups who are looking for plenty of room and their own space. It has been beautifully decorated and furnished and extremely well equipped, to ensure that you can relax and enjoy your time in Kalkan in comfort. It has a fully fitted kitchen comes complete with Fridge/Freezer, Oven, Hob, Microwave, Dishwasher and Toaster. Dining table is for 10 people inside and outside by the pool. Also there are 10 sunbeds with umbrellas by the pool terrace and wood pergola shade. The lounge on this level has plenty of seating for everyone and takes advantage of the country and sea-views. 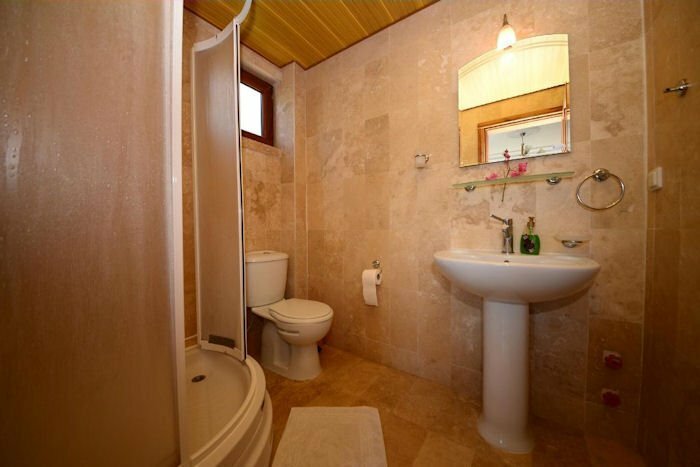 There is also a separate family bathroom and utility room. There are also three bedrooms on this level two of which are en-suite. The upper floor has a further well equipped full kitchen, identical lounge to the ground floor and bathroom. There are two further bedrooms here one of which is en-suite. Air-conditioned throughout and there is a flat screen TV,DVD player and Unlimited wifi internet connection. With stunning panoramic views the beautiful private swimming pool, you will want to spend much of your time outside. The pool is surrounded by a spacious patio area, equipped with sun-loungers and sun-shades. The villa is perfect for families and larger groups.